Work hard, keep asking questions and listen carefully. 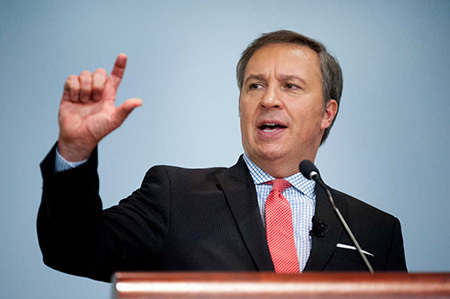 Dennis House, Eyewitness News anchor and Face the State moderator for WFSB, gave these tips and more to high school students and journalism advisers during his keynote address at the 32nd annual High School Journalism Day at Southern Connecticut State University Friday Oct. 30. More than 350 people attended the event, held at the Michael J. Adanti Student Center in New Haven. House, an Emmy award-winning journalist, has worked at WFSB since 1992. During his remarks, House revisited his first job in journalism — as a reporter for his high school newspaper. He told students about his job writing an endorsement for then President Jimmy Carter’s re-election campaign in 1980. 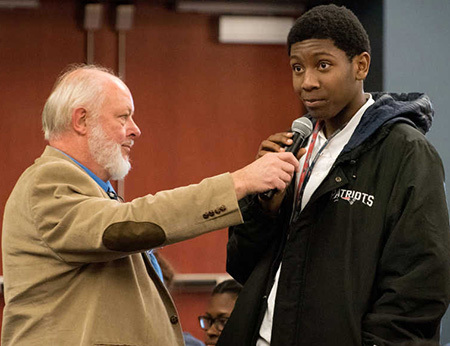 Dennis House addressed students at the 2015 High School Journalism Day at Southern Oct. 30. | Vern Williams photo. Ethics? Why does that matter? 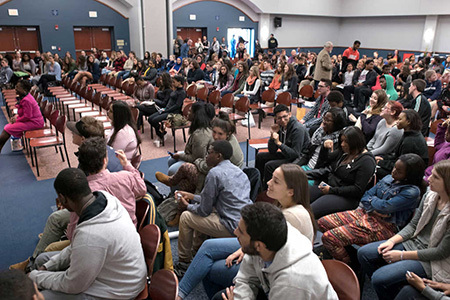 Southern’s Journalism Department hosts High School Journalism Day each year to contribute to the growth and preparation of future journalists from Connecticut. To see a photo gallery of images from the 2015 High School Journalism Day, click here.